You know, DC Comics is so often in the news for doing something weird, bad, or outrageously inappropriate, but I'm happy to applaud them when they do something right — like give Batman co-creator Bill Finger a long overdue cover credit on a Batman comic. Bill Finger, as not even all comic fans know, helped Bob Kane create Batman in that Bob Kane drew a red-suited superhero with a domino mask that bears no resemble to the character we know today and named him Bat-Man while Finger added every single other aspect of the character that we know, including his real costume, his origin, his setting, his lack of superpowers, the Batmobile, the Joker, and more. He also wrote or ghost-wrote all the Batman comics that Kane supposedly did back in the '30s and '40s. But you can finally see Finger's name on the cover of DC's 75th anniversary edition of Detective Comics #27, which will contain classic material from the 1939 issue and content from the recent New 52 Detective Comics #27, and will be given out free on July 23. This is the first time Finger has ever received a Batman cover credit, and it's taken a full 75 years. The most insane part? Legally, Finger can't be credited as co-creating Batman — Bob Kane forced DC to sign a contract basically naming him the sole creator in perpetuity (which also meant that Finger never saw a dime from any of Batman's movies, toys, merchandise, etc.). How did Kane force DC to do this when so many comic creators have gotten nothing? He lied about his age, claiming that he signed his first contract with DC when he was a minor. DC wanted the lawsuit to just go away, and caved on the new one. So even if DC Comics wanted to credit Finger, they can't. 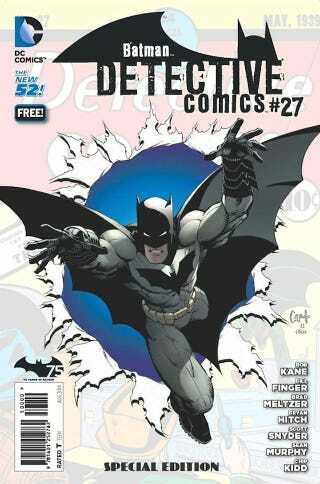 The only reason Finger's on this Detective Comics #27 special edition cover is because he was the comic's writer. So this is beyond overdue, but it's still a sad reminder of a man who gave us 90% of arguably the greatest superhero of all time, and the struggle to give him recongition that continues to this day. If you want to know more about what a terrible, terrible person Bob Kane was, you're not going to do better than this Comics Alliance article on the subject by renown Batman-ologist Chris Sims.